According to the Bible, the reign of King Solomon was marked by prosperity and wisdom. Throughout the books of Proverbs and Ecclesiastes, the monarch’s beliefs are expressed again and again: use good judgment, use money wisely and deal honorably with others. One aspect of using money wisely is allowing it to work for you. 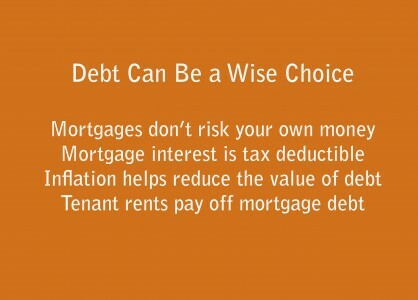 In the world of rental income property investing, one strategy for managing money prudently paradoxically involves remaining in debt. Another way that debt can work for the investor has to do with inflation. While inflation raises the price of consumer goods, so that the dollar you earn doesn’t go as far, it also reduces the value of debt. In periods of inflation, there’s a difference between the nominal value of a mortgage and its actual value – which is generally lower because the dollar’s value is being constantly devalued. So a mortgage has a real value that, depending on the rate of inflation, may be substantially lower than its nominal, or face value. With tenant rents paying down the mortgage on a regular basis, the investor can save a substantial amount on the debt owed. To earlier Americans, debt was a dirty word. But as Jason Hartman’s investing strategies demonstrate, in the world of income property investing, the debt associated with mortgages can be music to an investor’s ears. As King Solomon knew thousands of years ago, not simply having wealth, but managing it wisely, is the key to prosperity.